Hennessy technology have been a huge source of innovation in the worldwide Pork industry for the past 20 years. Prior to the acceptance of the industry that Hennessy had developed an automated objective instrumental means of identifying lean meat yield, knife grading was the subjective and often inaccurate method used to evaluate the worth of a carcass. As such batch averaging and commodity pricing were the true economic determinants of the Pork Industry. Meat yield grading has been well established in the world market for well over a decade and as such is responsible in part for reducing the commodity mentality to pricing. The next step in truly assessing the worth of an individual carcass is to introduce a quality payment incentive in addition to and similar with, that of yield payment schemes. More recently, Hennessy have developed their meat quality analysis technology so that a continuous quality scale can be implemented based on objective and measurable criteria. If you wish to access further information about PSE and meat science please follow the information links on the right side of this page. The results below are the comparison between the actual drip loss and the predicted drip loss, the actual loss from the LD muscle being measured at 96 hours post mortem after a standard storage procedure. Pork quality has been assessed and researched widely for over two decades with a variety of different approaches. Consequently different results and sometimes contradictory conclusions have been drawn from the research especially regarding pH45 and PHultimate predictions. In general many people in the meat industry have relied solely on pH as the definitive meat quality indicator. Unfortunately pH has proved to be of limited use in the "on line" situation where speed, safety and sampling frequency become a significant problem when using this technology. Often it is used solely to predict a few levels of muscle colour. Hennessy technology can be used to reliably identify ten shades of muscle and fat colour. Ten being the most convenient 'Keep it Simple' metric number. Nowadays the intrinsic objectivity of the method can be surpassed by other available technologies, and therefore its position as the unofficial industry standard is under pressure from more accurate technologies such as ours. Hennessy continuously strive to produce objective quality predictors with our technology. Recent work outlined in the charts above, albeit undertaken on limited samples, and other work published by academics suggests that quality measurements made at early post mortem times ( 30 < t < 60 minutes ) are both more informative and accurate in predicting carcass traits which are important contributors to final meat quality. 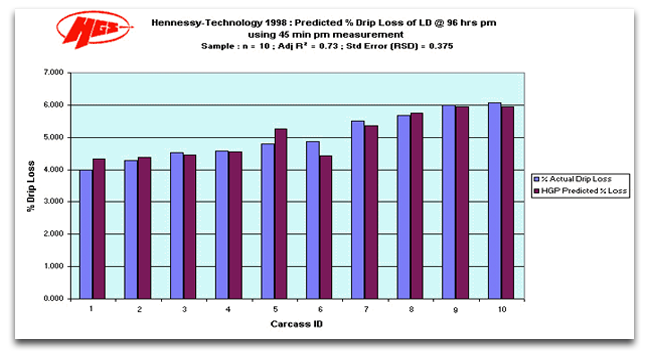 Based on Hennessy technology quality predictions, it is important to stress that post measurement treatments can then be put in place to optimize final quality.